Christmas ornaments sparkle and shine with gems and gold foil on these fabulous cards! 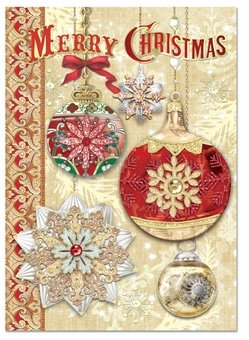 "Merry Christmas" is written across the top, with the decorations in shades of gold, red, silver and green dangling below. Inside, the printed text reads " Wishing you all the Joys of the Season".